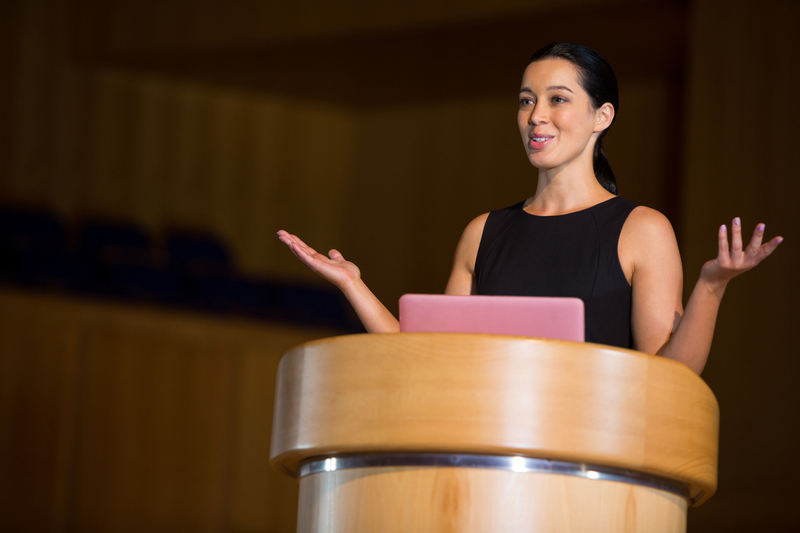 Persuasive speakers and influencers know that communication is not only about what you say, but how your nonverbal, body language expresses your intentions and emotions. Someone’s words may say one thing, but their body language may signal something different. Being mindful about body language can help you clearly communicate your message and lessen the risk of being misunderstood in your communication, relationships, and negotiations. An article from Lifehack highlights a list of the most common types of nonverbal communication. If you’d like your communication to be clear and persuasive, then pay attention to these nonverbal communication giants. Hand movements convey volumes of information and humans use hand gestures without thinking about it all day, every day. Some hand gestures are conscious like the “wave” to ask for help or flag down the tow truck driver or the “pointed finger” used to highlight or clarify whether we are talking about you or me. Some hand gestures are unconscious like the “steepled fingers” and can make a person appear centered, wise, and attentive. There are some gestures which fall under the “anxiety” heading like nail biting or fidgeting. These nonverbal hand gestures typically convey nervousness, insecurity, anxiety, or being withdrawn from the conversation. However, some gestures can have the opposite or unintended effect in communication. Pointing can be viewed as rude, threatening, or off putting. Point with caution! If you’re giving directions, try instead gesturing in a direction with an open palm perpendicular to the floor. How are you using your hands when communicating? Being mindful can make you better at communicating or influencing a discussion. Eyes can appear to “smile,” “throw darts,” or well with empathy. Similarly, there are different kinds of smiles which can communicate happiness, openness, warmth as well as caution or sadness. How often do you touch your face when you speak? People react to what they perceive your “eyes” or you face seems to communicate. Similarly, by avoiding eye contact, you may be signaling that you’re shy, nervous, lack confidence or aren’t attentive or interested. Beware the “raised eyebrow,” yours or theirs. You’ve been on the receiving end of this nonverbal gesture many times because there are parents, teachers, and Judge Judy in this world. Are you consistently doing this gesture more often than you know or maybe even intend? Does what you say match what your facial expression suggests? Being mindful about whose posture is in play, yours or theirs, can cause conversations to start, stall, continue or abruptly stop. Was it you who crossed your arms over your chest and ended a conversation in a nanosecond? If it was the other person, take that to mean your current communication intentions, style, and approach isn’t advancing your cause. Remember, there are many things you can do to communicate better without saying a word. Be mindful and practice nonverbal gestures you intend to attach to your verbal communication. Being more aware of all the messages you’re sending and receiving both verbally and nonverbally can help you better communicate and increase the likelihood of successful negotiations.